Given the Zelda series' proven quality, time and again, it's hard for anyone to say anything bad about it as a whole. Even if you disagree with the aesthetics of a certain title, such as the cel-shading of Wind Waker or the psuedo realism of Twilight Princess, the games are well put-together, well designed slices of gameplay which appeal to a very wide variety of gamers. That is... When they're designed by Nintendo. 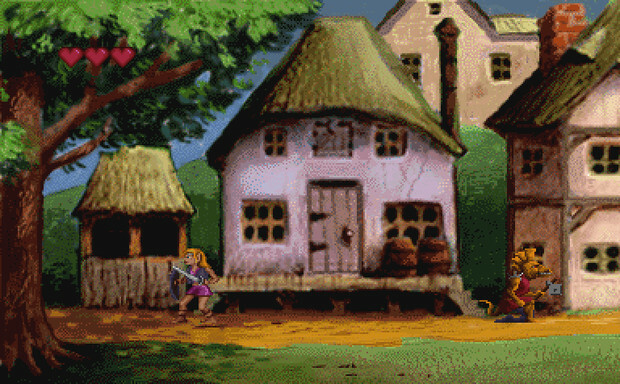 However, I was in the unique position in 1996 of being old enough to work illegally while also being young enough to be fooled by the Philips CDi's advertisements in gaming magazines and the promise of three Zelda games in stunning graphics, accompanied by still shots of (presumably) awesome animation for various events in the game. It's time to discuss the elephant in the room: Wand of Gamelon, Faces of Evil, and Zelda's Adventure. To be fair, my opinion going into this piece is not going to be unbiased. At the time... I'd just turned thirteen, and a local business owner made the promise of a lifetime to a thirteen-year-old facing down summer: A job. I'd applied at McDonald's when I was turned away after the interview because my sloppy writing made my thirteen look like an eighteen. Oh, and it was a hard job, too. Not having actually worked in the past (or knowing what, precisely, labour laws and minimum wage were), the offer looked too good to be true: Each of us would get forty whole dollars a day, along with an extra ten dollars for food and a half hour lunch break, to work at the man's vendor booth at the Toronto CNE from opening at 9:00 AM to closing at 11:00 PM. And we'd also get a ride to work at eight and a lift home at the end of the day, and a meal at the guy's bar on the way home! It was every thirteen-year-old's dream job: Sell some crap to tourists for (what we thought was) great money, get to eat fast food for lunch and dinner, and we were at the Exhibition! 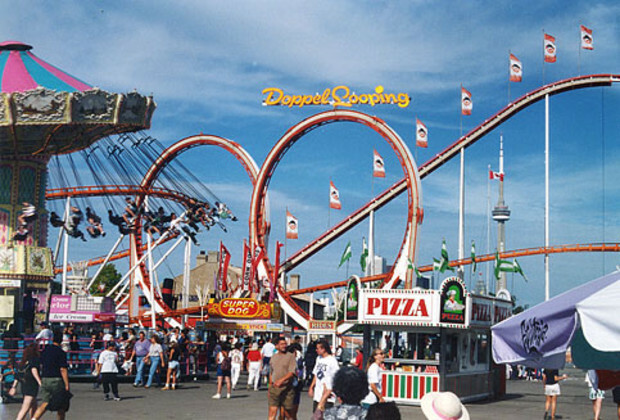 After downing a cheap hotdog, most of my lunch breaks were spent going on The Zipper! Every. Damned. Day. And after twenty full days of essentially working fourteen hour days, I had my prize in hand. Eight hundred dollars, a veritable fortune to a child my age. And I knew exactly what I wanted to do with it: Buy the CDi, as well as all three Zelda games. After all, for what the machine cost, they HAD to be the most amazing things in existence, right? I felt justified: My Playstation didn't really have any games which caught my attention. Beyond the Beyond was the only RPG I'd seen on the console, and the Nintendo 64 which was coming out didn't have ANY good games. I mean, Mario? Again? Please. Zelda was clearly where it was at, and I was about to get THREE of them. I wouldn't need a new game for months. And so, cash in hand, I went into Microplay. I bought a brand new CD-i and one copy each of Wand of Gamelon, Faces of Evil, and Zelda's Adventure. When I was done with my purchase, I had just enough to buy a McDonald's combo and a bag of chips from the grocery store on the way home. I had a full weekend until school started, and after I hooked my new console up I didn't intend to spend a minute more than necessary away from it. I decided to start with Zelda's Adventure. The live-action look actually appealed to me over the cartoonish sprites of Wand of Gamelon and Faces of Evil, given the fact that Mortal Kombat did pretty well with it. So I put the game in, reading the instruction manual and wrapping my mind around the strangely-designed controller in this new, modern console. I do remember the lack of any sign of Nintendo in the opening company credits montage, but at that point I was too excited to notice it. Sort of like a hiker missing the hiss of a rattlesnake, I guess. To say that Zelda's Adventure is an unplayable mess is a kindness. The game is not just bad for a Zelda game, it's just bad. It resembles a Zelda game in screenshots, and resembles your worst nightmares of what the franchise could be while being played. While the music is, for the time, fantasticly written and well-performed, that's the only nice thing one can say about the game. The live-action cutscenes are horrible and the gameplay is more backwards and illogical than some badly designed NES games. I now know that part of the game's problems are the console: Despite the increased storage having access to CDs granted it, the console had a mediocre chipset and relatively little RAM. It wasn't designed to be a gaming system, and it shows in the performance, as the machine chugged to a halt for long periods every time the game had to load a new area. And whatever problems I had with the controls, I know now that the hardware was as much to blame. 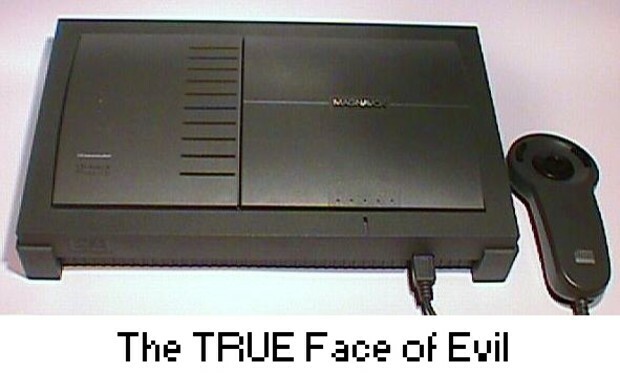 The controllers were uniformly terrible for the CD-i. However at the time, I only knew that a game series which had brought me joy ever since the first Legend of Zelda game had now nearly brought me to tears with frustration and regret. Even Wand of Gamelon and Faces of Evil, while better than Zelda's Adventure, just didn't strike the exciting Zelda spark. Mere hours after I'd purchased the system, I'd packed it back into my closet. It would be years before I unearthed them while moving out of my parent's home, and multiple moves beyond that one before I finally hooked the console back up and given them a fair shake. These days, objectively speaking, Wand of Gamelon and Faces of Evil don't strike me as terrible. Quirky titles, yes, and certainly the controls could be tighter, but going back to them with the breadth of gaming experience and the patience of an adult, they're certainly less terrible than my horrified teenage brain remembers them being. They've got some interesting design choices, and as long as you don't go into them expecting a Zelda-quality title, they're not entirely horrific. I've certainly endured worse titles. However, even with all the joy the series has brought me, a new Zelda title sends a completely unwarranted shiver of horror through my frame. Objectively speaking, I know that Nintendo could never produce a title half as bad as Zelda's Adventure. Objectively speaking, I know that no system produced by Nintendo will ever give a game controls as poor as Wand of Gamelon and Faces of Evil possess. Yet nothing can erase the memories of having purchased the Unholy Triforce. Nothing.